Since 2010 I've been interested in building a quadcopter. My initial experiment in building a frame (Summer 2010) with metal tubing and metal plates turned out to be quite disappointing as the arms warped and screws rattled free. 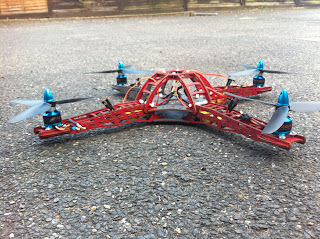 April 2011 brought a hobbyking quadcopter frame to my door. It's wood and fiberglass, and nylon screws and bolts - it looks a little fragile, but we shall see after bolting the motors to it! I spent a couple of hours Monday and Tuesday (today) building the frame and bolting it together with the nylon screws and bolts. I've got one thing to say, "oww" those nylon nuts sure do hurt! I'll have to hunt down my needle nosed plyers to hold them to tighten them up. My motors don't fit - the metal cross mounts overlap somewhat on the wooden frame and almost sits comfortably. I suspect I'll need to get some spacers to fix this. I'll also need to glue the bits I should have glued (according to the instructions) But that's later, I'll probably have to unmount various bits and bobs when I install the electronics. The feet/stand look horrible. I'm not fixing those to it, I'll have to have a look at regular heli skids or build something myself. Ditto the camera mount. The frame seems to be designed for + rather than X flying, which is a little confusing also.